Children need time to reflect, process, and digest. What time is allowed for your child each day to tune in to self? Our current societal environment is comprised of countless disparate influences; it is a constant flow of information, voices, noise, and opinions. Your child deserves time with his own innate wisdom, the sensitivities which he carries. Consider the simple act of lighting a candle. Take a deep breath, allow yourself to feel your feet upon the earth, center yourself, strike the match, touch the light to the wick, and pause. Take time to do this for yourself and you may be surprised how these few moments can multiply and ripple out into your life. I have never met a child who was not captivated by a lit candle. Perhaps add this ritual to your mealtimes or light a candle at bedtime for evening reflection, allow the child to enjoy silence, and then to extinguish the light when he is ready. 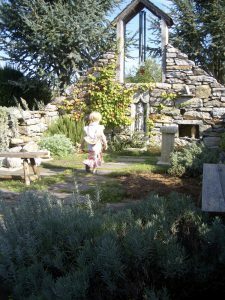 This photograph shows a young child walking in a public herb garden. She found this place of reverence and was immediately attracted to it, she felt welcome to enter. What places invite your child to be mindful? Does he have the opportunity to venture in, respectfully, with your guidance? When your child enters a quiet place, notice, how does he respond? What can you observe about him? Our children are magnificently endowed with an awareness of subtleties around them. If we protect them and refrain from overwhelming their senses with unnecessary input, they are free to grow in their understanding of themselves and the significance of personal silence. If we listen well, a child might voice what he is noticing and offer inspiration to us. In the Montessori Children’s House, children play the Silence Game wherein the teacher explains what silence is and she tells the children that she will call each by name but only in the tiniest whisper so as not to disturb the shared silence. The silence is completely dependent on every child’s participation. For some, the focus necessary to calm their bodies and minds is almost impossible which makes the achieved silence all the sweeter. The community shares the powerful experience of creating this unique space and time together. For some groups, it can take many attempts in order to finally reach silence. The marvel in their eyes expresses to me that they understand silence as something precious. Please remember to offer your child a taste of silence every day as this chance to slow down, contemplate, and notice is vital to his wellbeing and sense of inner peace. 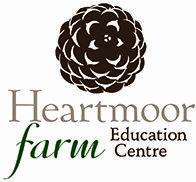 Thank you for joining us here at the Heartmoor Farm Education Centre Family Life Enrichment Blog. Please visit again, and feel free to contact us if you would like more information about creating a vibrant, nurturing home environment for children.